Founded in 1980, ORT was settled down under the protection of the Regional Government of the Tuscany, Common id Florence and the Province. Under the artistic direction of Luciano Berio, to ORT the acknowledgment of excellence from part of the Ministry for the Cultural Transactions was given Italian. Today, under the direction artistic diell'abile Sergio Sablich and accommodated from the historical Theatre Greens, in the heart of Florence, the shows of the ORT are transmitted from RAI and Radiotre on national platform. The Orchestra is composed from 45 musicians, uniforms between groups: The Solisti of the ORT, OrtEnsemble, Harmoniemusik - the Breaths of the ORT. From the Baroque to music today: Skillful executor of an immense repertorio that goes from the baroque to the contemporary composers, the Orchestra sound Haydn, Mozart, all the sinfonie of Beethoven, and widths selections of instrumental baroque music, with a particular emphasis in the presentations of rare jobs. Beyond to the choral capolavori, ORT has represented Lieder di Mahler, the choral jobs of Brahms, and one operating selection with the emphasis on Rossini. The Tuscany formation has a prominence on the Italian scene thanks to its attitude in the musical field in 20° the century and a peculiar attention to contemporary music. One has exhibited with rinomati solisti and famous directors; it has accompanied young artists to their debut, and has included in its programs also teatrali shows and of dance. It invites you from the main Italian Societies of Concert, have been exhibited with large happening to the Theatre of the Scale of Milan, to the Communal Theatre of Florence, the Communal Theatre of Bologna, the Carl Felice of Genoa, Auditorium “G.Agnelli” of the Ingot of Turin and to the Academy of S.Cecilia of Rome. 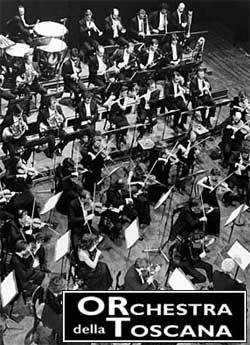 The Orchestra collaborates with the Musical May Fiorentino and the Ravenna Festival, and from 1995 it participates to the Rossini Opera Festival. Tour international from the 1992 has comprised: Germany, Japan, Salisburgo, Cannes, Buenos Aires, Saint Paul, Montevideo, Strasburgo, New York, Edinburgo, Madrid. From 1988, ORT has recorded numerous exhibitions: jobs of Schubert and Cherubs, directed from Donated Renzetti for Europe Music, Pierino and lupo and the History of Babar with actor Paul Poles, directed from Alexander Pinzauti for Caroman, directed rusticana Cavalry from Bruno Bartoletti for Foné, the Barber of Seville directed from Gianluigi Gelmetti for EMI Classics, I pay to Mine and Orfeo singing removed of Adrian Guarnieri for Memories, Stabat Mater di Rossini directed from Gianluigi Gelmetti, for Agorà, Holy Sea di Butch Morris peor Splasc (h), Richard Galliano with “the Solisti of the Ort” for Dreyfus. Of recent realization the Tancredi di Rossini directed from Gianluigi Gelmetti.